Here’s a coincidence. Germany, Sweden, and France have all been taking in unassimilable numbers of refugees from the Middle East and Africa. In all three countries, the results have been the same. The Scandinavian country is facing an existential crisis with on average three police officers handing in their resignations a day. There are now reportedly 52 no-go zones in Sweden. These are Muslim areas that are regarded as unpoliceable. The good news is that the number of no-go zones will soon decline to one. The bad news is that it will take up all of Sweden. 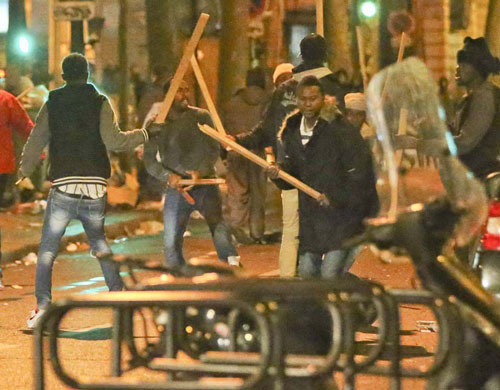 A migrant turf war erupted into violence on the streets of one of Paris’ trendiest neighbourhoods early [yesterday] morning as asylum seekers beat each other to a pulp with wooden clubs. The Jungle was a colony Third Worlders had established at Calais as a staging ground for their ongoing invasion of Britain. When French authorities finally did something about it, the colonists turned up in the capital. The once peaceful neighbourhood, in Paris’ 10th Arrondissement, used to be a popular area with tourists, boasting a lively nightlife scene bustling with restaurants and bars. Residents in the once popular district say that the squatters are now becoming increasingly violent and dangerous, with increased reports of muggings. But maybe it will turn out differently if we let them flood the USA. Why not try it and see? We have nothing to lose but our country. Paris under Third World occupation. On tips from Rob E, Torcer, and Bodhisattva. Cross-posted at Moonbattery.